As you know already, thrift stores and flea markets are my second homes. 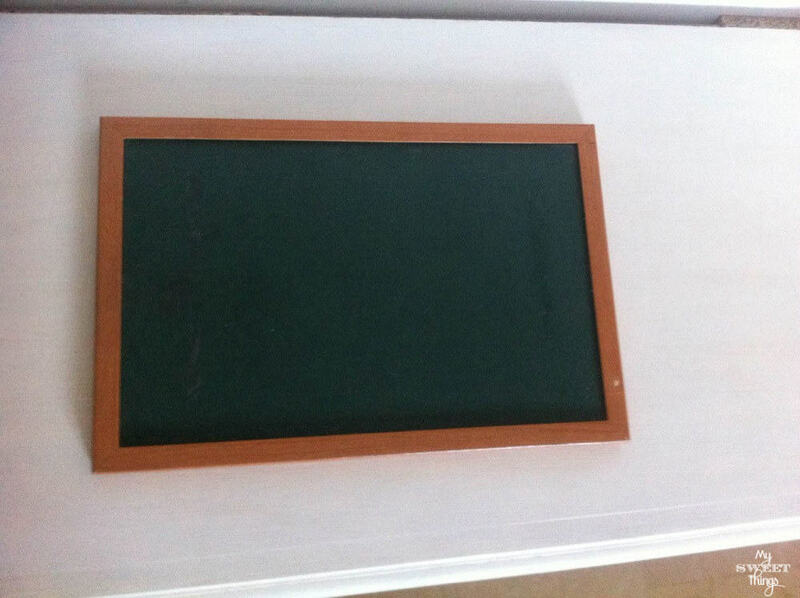 So when I spotted this old chalkboard for only 0,50 € I didn’t think it twice and I grabbed it… I was not going to give anyone else a chance to get it. No no, she was coming home with me for a face lift! A friend of mine has a big and pretty chalkboard in her kitchen, and every time I go visit her and I see it, my hearts melts. 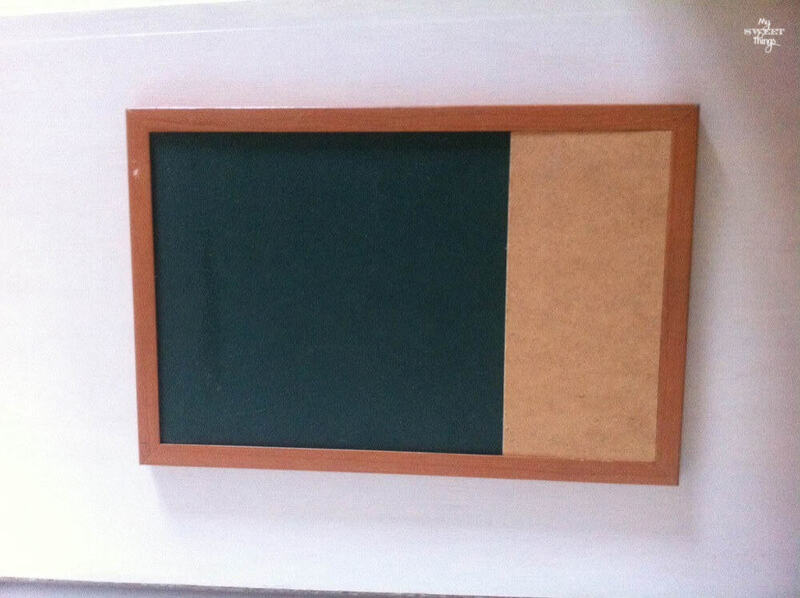 I thought I could do something similar but on the cheap way, so the first thing was to cut some thin plywood to fit inside the chalkboard. I made some black DIY chalk paint to replace that ugly green color it had. I took a dry brush and some white paint and added a bit of white to the frame. The funniest part was to wrap the plywood with a pretty graphic I found. It looked so cute I decided to take a piece of scrap wood and do the same; that way I was going to have a chalkboard and a hanger for the kitchen. It only needed four hooks and some varnish. I love it!! It has nothing to do with the chalkboard I bought and it took me less than an hour to do it! It is the kind of projects I like most, cheap and frugal. I hope you like it too. Be sure to check out my fellow bloggers’ projects too! If you want to check some others makeovers and projects, you will find them at the Gallery. This entry was posted in Before & After and tagged Before & After, Chalk Paint, Chalkboard, Decor, Decoupage, DIY, home decor, Makeover, Recycle. Pili, when I saw that you were doing the Thrift Store Challenge also, I had to come look because I knew it would be good. This is geat! Awww, thank you so much Sherry!! Love this challenge, I’m going to check the other posts! What a great makeover Pili! I love how it turned out and the matching kitchen hanger. I really like those graphic’s. I sure wish that I had more time so that i could participate in things like the Thrift Store Decor Upcycle Challenge, sounds like lots of fun. Hi, Linda! 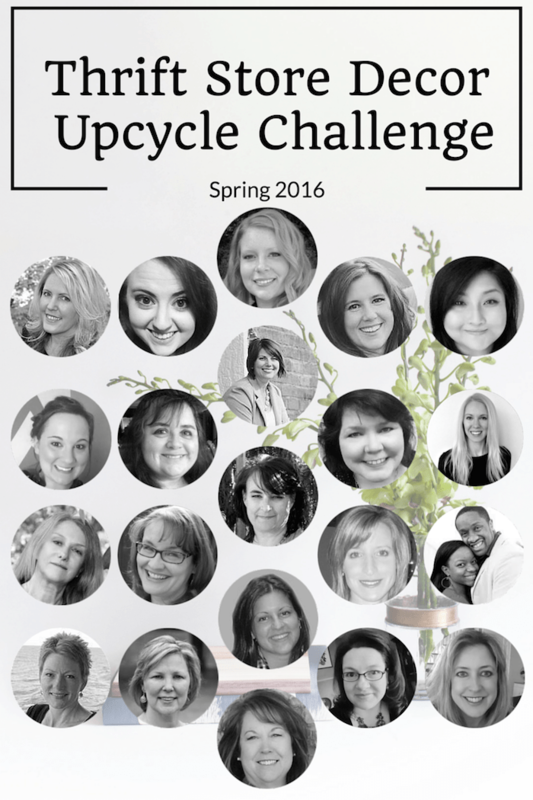 I’ve seen lots of bloggers participating in challenges like this and always wanted to try, it’s been really fun!! Pili I love the graphic you chose. It is perfect for the kitchen and the colors are so warm and pretty. I also think it was a good idea that you softened up the wood a bit with the white chalk paint. Beautifully done! Mary, that graphic is so pretty! It helped a lot on the makeover. Glad you like it too!! Great makeover and they both look store bought, no way you could tell they were from a thrift store! I love a good chalkboard! So functional, and a bonus when you can get it at a thrift store and make it over! There are not enough chalkboards at home, right? We have lots, this way the girls don’t fight for one. Thanks for stopping by, Chelc! 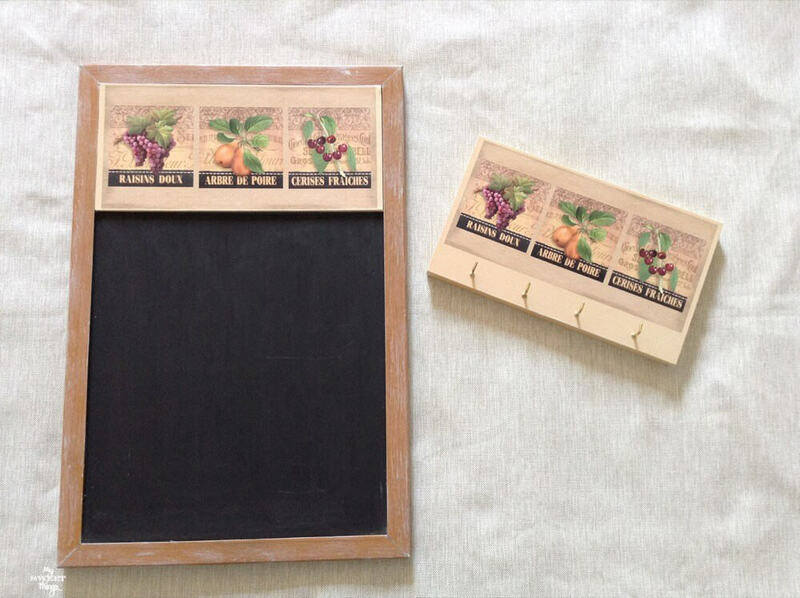 The graphic that you used is perfect for a kitchen chalkboard. Cute makeover and practical! Awesome makeover! So cute and looks nothing like what you started with. Aww, thanks Julie!! That’s why I love thrift stores so much, lots of potential stuff looking for being discovered! This chalkboard makeover is great! I love chalkboards too. They are so useful! Hi, Michelle!! Thank you so much! I agree with you, chalkboards are always useful! Pili, love the new look you gave the chalkboard and what a cool hanger to match!!! You can’t beat that price either!! Many thanks, Keri! You know me, the cheaper the better! I really love this. I can see it in the mudroom. A chalkboard for a quick reminder note to self and a place for key. Cute idea. Yes, chalkboards look great and they are useful wherever you place them. Great transformation Pili!! Love the graphic you used too. Thanks for putting this together, Amanda!! Glad you like it too! Your chalkboard turned out so nice. I love all the details you added. Hi, Erlene! My friend’s chalkboard was the inspiration, it is so pretty! But mine turned out cute too, I’m pleased with it! It looks awesome Pili! You added some cute detail to the chalkboard and I’m loving the price tag! Thanks Katrin, the design made all the difference, love it! This is such a great idea. I love the elegant look and feel. The print is so pretty that it gives the chalkboard that elegant look. Thanks so much for visiting! Your chalkboard turned out so cute. I love the fruit art details, so cute. I know you will enjoy your chalkboard in your kitchen too. This has been such a fun challenge to find fun ideas. Hi, Shirley!! I agree, it has been really fun! I love to go thrift shopping and that chalkboard caught my eye! Another great makeover Pili! Thanks for sharing with us at Over the Moon and have a great week! Thank you so much, Sue!! Your chalkboard & matching hanger turned out so pretty! Many thanks, Emily!! I love them too! Pili, your chalkboard makeover looks great. I love the details on it. Thanks for sharing at Snickerdoodle Sunday. Pinned and Tweeted. Thank you so much, Beverly!! It’s been so easy but I really like how it looks now! 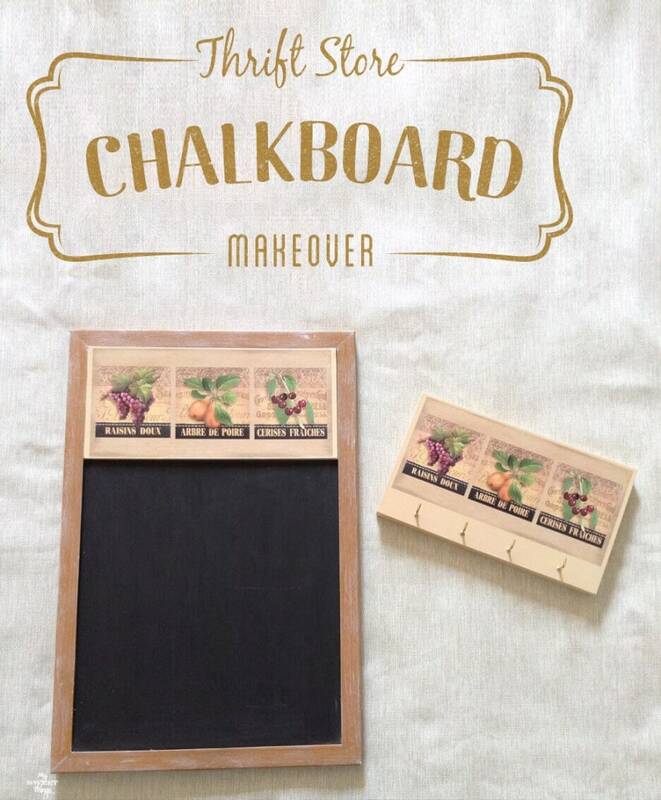 What a clever way to transform this plain old thrift store chalkboard. Thanks for sharing with Talk of the Town. I love simple and fast makeovers, Betsy. Glad you like the result too. I love this – I’m going to start looking for the black board! Thanks for sharing at the DIY party! Thanks for stopping by and hosting, Helen!! Oh, thank you so much, Stella!! It was really fun to upcycle that chalkboard! Hi, Jes!! Welcome to my little corner, thanks so much for stopping by and taking the time to leave me your comment. What a lovely collection of upcycling projects. Your chalkboard looks fantastic. Did you use wood glue to affix the picture to the plywood or something else? Yes, I forgot to mention it in the post. I affixed the plywood with some wood glue, and then stacked some books on it until the next day. Thanks for visiting, Sally, I really appreciate you stopping by each week! Yes, it is my kind of project too. I am so impatient that I want to get it done in minutes! Love the chalkboard Pili! The graphic you used is so perfect for a kitchen, and how fun to have the hanger to match. Thanks so much for sharing at Vintage Charm. Tuula, the graphic is pretty itself so half the work was done with it. You are too sweet, Mimi! Thanks for visiting! What a great project. I love what you came up with, the graphic looks really great on the chalkboard. And on the hanger. This will really look great in your kitchen, all for a few pennies and a whole lot of imagination! Thanks Nikki. I had the graphics long ago and I wanted to use them on something. I agree they look great.